Sandringham Yacht Club, Aka SYC, is one of Melbourne’s most famous and unique waterfront wedding venues. With the panorama view of the Port Phillip Bay, the delicious and exquisite cuisine, and the prime location at the City of Bayside, Sandringham Yacht Club is a prefect wedding venue for your dream big day. For the wedding ceremony at Sandringham Yacht Club, Southern Podium, with the capacity of 160 people, is a spacious and gorgeous place to day “I DO”. The breathtaking view of Port Phillip Bay is the prefect backdrop for your wedding ceremony photography. When the crazy Melbourne weather come, Sandringham Yacht Club also has a backup indoor option for you. For the wedding receptions, the Port Phillip Room of the SYC can comfortably accommodate 250 people seated and still come with a spacious dancing floor for the wedding night entertainment. The sensational food and drinks will pamper you and your guest’s mouth and stomach. 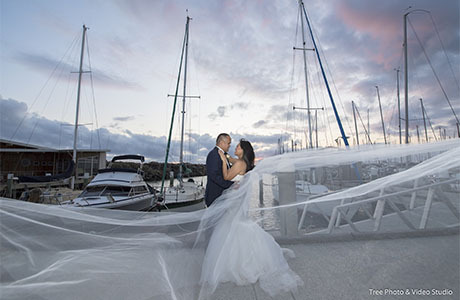 At the Sandringham Yacht Club, even though there are diverse opportunities for Wedding Photography, the Sunset Wedding Photos is the icon for this wedding Venue. 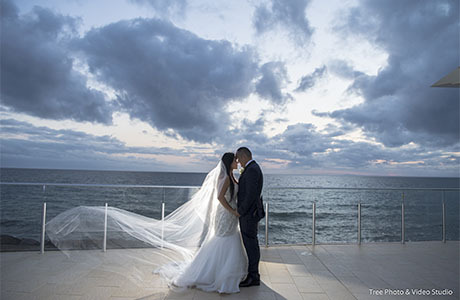 Whether it is summer wedding or winter wedding, the sunset with the ocean view is simply spectacular. Any experienced wedding photographer in Melbourne won’t miss this opportunity to create some gorgeous and artistic wedding photos. From a Melbourne wedding photographer’s perspective, Sandringham Yacht Club is one wedding reception venue for a modern and epic wedding. Should you have any questions to plan a wedding at Sandringham Yacht Club, please do not hesitate to Contact Us for the suggestions and information from a wedding photographer’s view.